Blogging has its own advantage. I was used to cooking same food with same ingredients before I started blogging. I must admit that the time I am referring goes back to the era of me being a novice cook and I was not in a position to identify and differentiate one ingredient from other, especially when it came to lentils and flours. There were times when I mistook channa dal for toor dal and ended up using fine rice flour in place of maida to make Naan. And horrors of horror when I ended up using all that expensive Basmati rice in preparing Dosa batter, fit for one small army to feed, back in India. It’s a different story that I use Basmati rice quite often to make Dosa batter as they are much cheaper than Idli and Dosa rice we get here. It’s since I started posting recipes in my blog that I learnt numerous recipes from different part of the world and discovered new ingredients which were unheard of while growing up. My Amma is an exceptional cook who even today fascinates me with her innovative recipes using rarest of ingredients. Fortunately I am like her when it comes to experimenting with ingredients and learning new recipes., just moving little away from comfort zone. Food blog world is one such place where you get to see and learn something unique every single day. Everyday I go through fascinating and adventurous journey of innovation in cooking with rare ingredients and I must say I am enjoying it thoroughly. But there are sometimes when I get recipe requests from readers of Monsoon Spice with few ingredients which I have never tried or tasted. 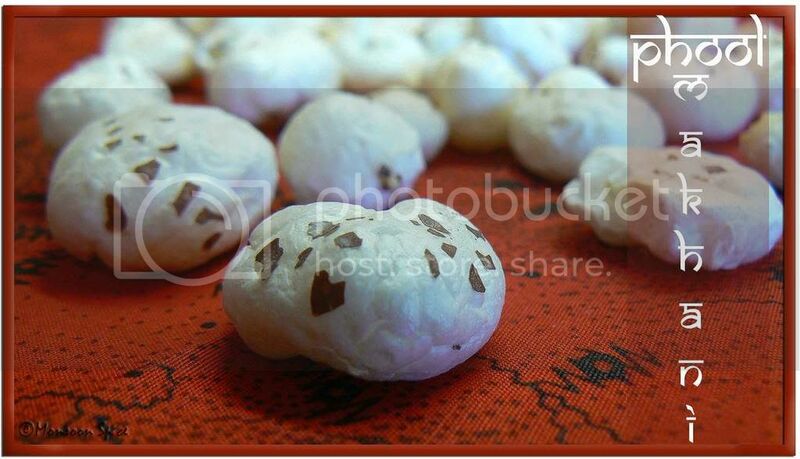 Some time back I received a recipe request from one of the readers to post Phool Makahni aka Puffed Lotus Seeds recipe. Till then I was not that familier with lotus seeds and I had no idea that there was puffed lotus seeds just like puffed rice or pop corns. Yes, they do look like pop corns and I felt to some extent they did taste like one especially when they are deep fried. Before I knew, I ended up eating half a cup of fried phool makhani sprinkled with little chilli powder and salt and had to fry little more for the curry. I had to stop myself from popping few more puffed lotus seeds and proceed into making this delicious Phool Makhani Curry. This is a recipe I put together from various recipes found all over the web world. Most of the recipes had three things in common, coconut, cashews and poppy seeds. And all the recipes asked I deep fry these Phool Makhani before adding it to base gravy. But next time I am going to pan fry these puffed lotus seeds with little oil till they turn golden to reduce little amount of fat and calorie. And one more thing lesson I learnt is to buy extra pack of these puffed lotus seeds just to eat with little sprinkle of salt and pepper ;) In the end we had this delicious tasting bowl of curry which was creamy from addition of coconut, poppy seeds and cashews with touch of little spice notes to it from aromatic whole spices and spice powder used. Fried Phool Makhani, which is quite crisp when deep fried, transforms into melt-in-mouth creamy delight when added to the base gravy is one whole new experience we really enjoyed. This is my entry for Kayln's WHB guest hosted by Joanna. Deep fry phool makhani in heated oil till it turns light golden brown in colour and place them on paper towel to drain excess oil. Grind cashews, roasted poppy seeds, cardamom, cinnamon, cloves, ginger and coconut to smooth paste adding little water at time. Heat oil in a pan and add cumin seeds. When they start to sizzle, add finely chopped onion and sauté till they turn golden brown. Mix in ground paste and keep stirring for about 4-5 minutes till the masala paste turns light brown in colour and becomes dry. Now add finely chopped tomatoes, garam malasa, kitchen king masala, sugar and give it a good stir till tomatoes turn pulpy, about 2-3 minutes. Add around 1½-2 cups of water and mix in salt to taste. Cook this gravy on medium-low heat for about 10 mins, stirring in between. Now add fried phool makhani and mix well. You can add little more water if needed depending on required consistency of the gravy. Cook on low heat for another 3-5 minutes. Mix in finely chopped coriander leaves and serve this delicious Phool Makhani Curry with roti, chapatti or rice of your choice. Phool Makhani takes very few minutes to absorb all that gravy and turns into creamy delight. So add it to the gravy just five minutes before you switch off the gravy. Although this time I deep fried these puffed lotus seeds I would suggest you to try pan frying them in batches with very little oil till it turns light golden if you want to restrict fat and calorie content. You can also serve these fried Puffed lotus seeds with little sprinkle of salt and chilli powder. I have never made anything woth lotus seed. WOW.... that was a decadent makhani curry. Looks so cool. YUM! so different. I really like this curry using the Makhane..as we call it in North India..I made it just today but just roasted it with a tiny amount of ghee and sprinked salt and pepper..Its one of the fav snacks of my hubby!! I have seen those lotus seeds many times in Indian store but didn't know what to do with them. I will have to try this sometime. Phool? Never tried these ever so far.I have to see if I get them in here. I go to Indian store once in 2 or 3 mnts, it's about 100miles away but there is a small store nearby! Nice gravy,but i found one unusual thing,i.e frying makhaney,coz i haven't heard of frying these. We make it with potatoes and macroni ,and they do taste ok,so i used to substitute these with peas.but now ,i will try to utilise the whole stock of makhaney,this way.....thnks for gr8 variation! Wow, today looking at ur recipe i came to know about the puffed white round ball i used to see in any Indian store !! Never knew what to make of it :) !! Shall try this recipe !! Looks yummy!! Nice pic Dear :) !! Puffed Lotus Seeds.....thanks to your post, i came to know that such a thing exists!! 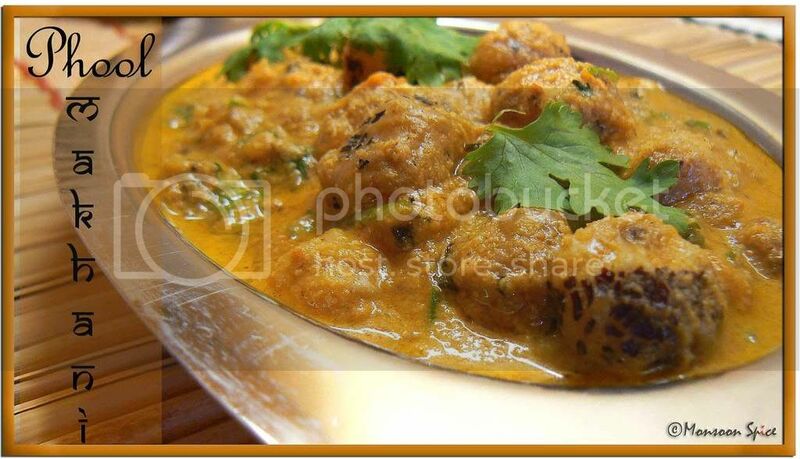 :) three cheers to blogging :) curry looks quite rich and creamy! phoo makhani means puffed lotus seeds!!! Thank You so much for your great information. 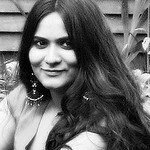 happy to inform u that i have added ur blog to my blogroll. Sia, I tasted Lotus seeds from a friend's lunch box the other day. Puffed Lotus Seeds now :) I have to find if I can find them at my favorite store. The curry looks rich and creamy and ofcourse delicious. sia..that looks great..I have not seen this before..so nice knowing abt it...would've been great if you had taken a long shot..just to know their size..:))..thanks for sharing and teaching me something new today!.. WOW OOOhhh am just drooling here thats some really mouthwatering dish. Nice Presantaion and I love pics. Bookmarked it and am sure gonna try it. puffed lotus seeds - hmmmm - i wonder if ordinary lotus seeds can be puffed in the oven like pop corn. will experiment. A great curry,I had heard about it but never tried.A great curry indeed and lovely write up. Sia, at one time, in AP, this routinely made an appearance in weddings - considered an accompaniment for pulao. And it was one of those things we saw only at weddings, you know, never anywhere else, not even in restaurants. I quite liked it. The roasted makhane are nice too! Thank you so much for visiting my blog.I havent made anything with lotus seeds.Looks different. You've been coming up with nice combinatins, Sups! Almost picked lotus roots but hubby made a face :D I'll look for lotus seeds next time, never seen it here. I love these, we call them full patasha, but we do not fry them. I have a recipe in draft and will post it soon, I did not know they are lotus seeds. Love this recipe and will try it and let u know. this recipe is new to me...nevr tried lotus seeds...ur curry looks tempting....is lotus seeds chewy like the one v get as soya chunks? WOW this is very new to me. oh curry looks awesome Sia. can't wait to try. Lovely entry!!! Ohh, never knew Phool Makhani is used this way. Always thgt its a spice, duhhh...Ur curry looks just gorgeous Sia !! wow, never heard of lotus seeds before. looks delicious. Wow, I have never heard of this before. Now my eyes will definitely be on the lookout for this ingredient when I go for groceries next time! Your Curry looks delicious and appetizing, Sia! 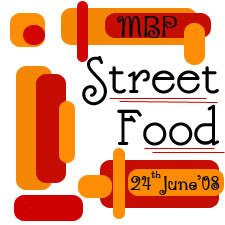 Have sent in an entry for MBP - street food... hope you got the mail. Thx Sia. Makhani looks delicious Sia. I never tried this Makhani before. Thanks for sharing this recipe. Check my blog for surprise. I was thinking the same thing today. The world of blogging is such a wonderful and educational resource. I remember eating curry with phool in Calcutta but I'd totally forgotten about them! Sia, I can't tell you how much I love the photo of the lotus seed plain. WOW! I keep seeing this on the supermarket shelves but never thought of buying some. I definitely will next time. Looks delicious! 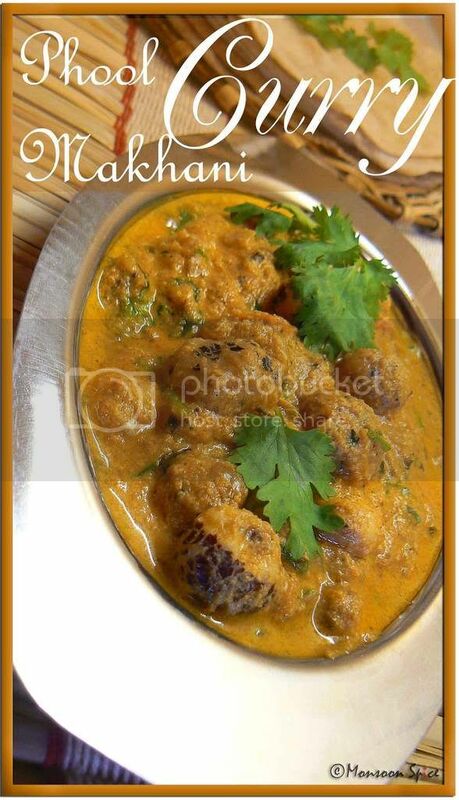 The only catch is anything with Makhana is usually heavy. I guess they absorb a lot of oil during cooking. And do let me know how shimla mirch turned up after baking..though i don't have an oven yet,but it wud be helpful for others to know baked version ! Thanks for ur comments dear....U just made my day! puffed lotus seeds? Wow, you are right, blogging does expand your knowledge quite a bit... I have never seen those..... The gravy looks delicious! Check out my entry for Bottle gourd recipes! hi, we get dried lotus seeds pack in the chinese stores here. is it ok to use it directly for making the recipe you have given? or should it be soaked in water for some time? I have never used dried lotus seeds Jery, so i may not be the right person to answer. but i checked few websites which said u need to soak them in water for few mins. please google for more info. I am Prathiba Rao from The indian food court. You have a wonderful blog with vow recipes. I just want to know what is a lotus seed??????? Please an alternate English word for the same???????? or a Kannada or a Konkani word for it. Thanks a lot. I never knew you blog so well and that too you blog about receipes! Just loved your blog site and your receipes. Today Venki will have to deal with this phool Makhani curry for he has picked 2 packs of it. I didnt know what to do and this blog has really helped me! Thanks suppi and love to krish!